Lamzac will be, from today on, the indispensable companion wherever you go. Super fun and amazing Lamzac quickly turns into a fantastic puff! Large and comfortable is easy to fill, and also easy to empty. Lamzac needs air to live... you need Lamzac to relax!!! The filling is "air", just one or two movements and Lamzac is ready for use. When empty, Lamzac can be transported in a practical and small bag, which can be taken everywhere! Lamzac is thus the perfect companion for: a picnic, a festival, to the beach, in the countryside, in the garden... everywhere. Prepare yourself to be the center of attention: you and Lamzac!!! Made of highly resistant nylon, the inner bag is in high-density polyethylene. Very sturdy, supports up to 200 kg and is water repellent. To clean just use a soft and wet rag. Wherever you go, make yourself comfortable. 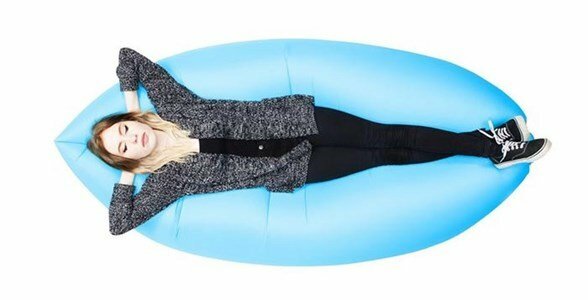 Lamzac is simple and fun: and it will be your summer's best friend. Find out what are the products that you can't miss for a perfect Summer.